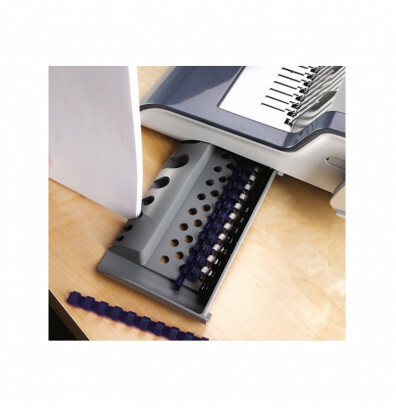 Fellowes Quasar E 500 comb binding machine features electric punching at the push of a button. A document measuring guide helps choose correct comb size. Ideal for large offices. 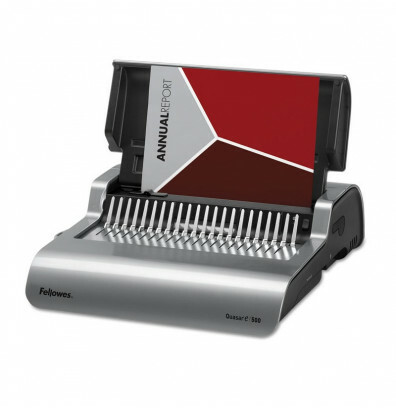 Fellowes Quasar E 500 comb binding machine punches up to 25 sheets at a time. Loads vertically for accurate punch alignment. Binds up to 500 sheets with a 2" comb. A rotary edge guide centers documents with ease. A built-in, mistake-proof measuring tool helps select the right comb size for document. 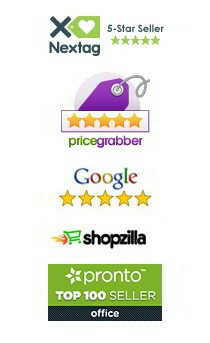 Allows user to punch and bind continuously for maximum productivity. Binding supplies can be neatly stored and organized with the internal storage tray. Ideal for large office environments. 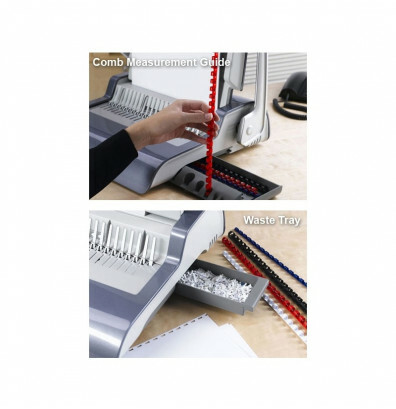 This Quasar E comb binding machine includes a comb storage tray, document measurement tool, and a binding starter pack kit: 1/4" white combs (5), 5/16" blue combs (5), clear letter covers (10), Expressions grain blue letter covers (5), and Expressions grain white letter covers (5). This is a very good product. Easy and makes for quick work.